Unique style and plenty of features make this an extremely popular looper pedal. CNZ Audio is a very, very popular guitar pedal brand that has a wide variety of models in their catalog, including the Tape-Echo guitar FX pedal, the Dumble overdrive, Mod station processor unit, Time Warp Multi Delay pedal, and plenty of other exceptional models. What’s more, they also manufacture entry-level guitars, so if you’ve just started out, you might want to check them out as well. Now, Re-Pete looper pedal is one of the most exquisite guitar pedals you’ll find on the market, and not just in the ‘looper’ section – anywhere. On a ‘less complex’ side, its core features are formidable as well, such as the unlimited overdubbing or high total recording time. Check out our looper pedal buying guide for the other contenders. First and foremost, Re-Pete features 10-minute recording time atop the unlimited overdubbing. These are what we’ve just labeled as ‘core’ features, as every other feature practically serves these two. There are two inputs, meaning that up to two instruments can wire up to it simultaneously, which is quite great and not so common. Re-Pete is also USB compliant, allowing for direct loop track upload/download in the easiest manner possible. On the downside, it has a rather big footprint, so fitting it next to your other pedals might be a bit harder. Actually, the controls are what make Re-Pete so confusing. There’s quite a number of them, and they’re not exactly so well illustrated on the pedal. The first knob is Level L (left), which adjusts the volume of the instrument which is plugged in the ‘left in’, and the same applies for the next knob – Level R (right). There’s a three-way switch between them, allowing you to change, forward, or reverse the loops. Right next to it is the ‘Stop FX’, and the ‘Speed’ knob. On the bottom left side, there’s the ‘looper’ switch which should be used to make and switch between loops. The ‘FX’ switch on the bottom right side applies the effects on the loop layers. In truth, this pedal works like a charm once you get the hang of it. It’s mainly due to its ‘wild’ appearance that people find it confusing. There are numerous arrow-shaped graphics on the pedal that might confuse a beginner, or even an intermediate level player, so we suggest that you refrain from using it for live performance until you’ve learned every single bit of it. Due to its huge versatility and excellent audio playback, the Re-Pete looper is perfect for studio work. As for the matter of whether it’s good for band practice or not, the situation is similar to what we’ve just said about live performances – if you didn’t manage to grasp the gist of it, you’ll just leave your band mates waiting for you between songs where you use the pedal. It looks confusing and exquisite, it’s versatile, and performs excellent sonically. 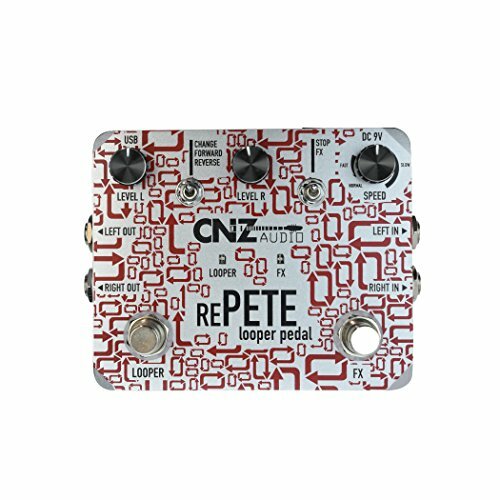 Re-Pete isn’t an expensive pedal, but we suggest you consider it if you have any prior experience with looper pedals in general since it’s not so easy to use.